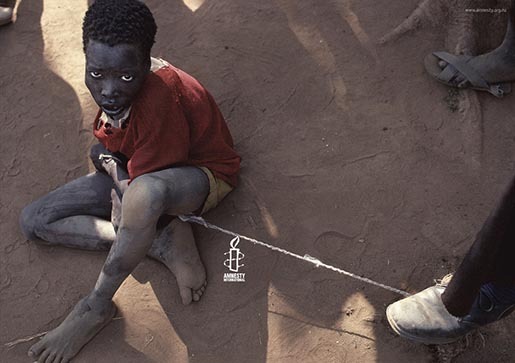 Amnesty International launched a print campaign in New Zealand placing the Amnesty symbol as the flame that can burn the ropes that bind prisoners in Fallujah, Iraq, Sudan and Bolivia. The campaign won a Bronze Press Lion at Cannes International Advertising Festival 2007. 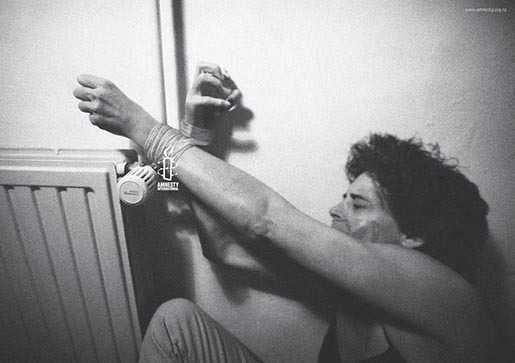 The Amnesty campaign was developed at Publicis Mojo, Auckland, by executive creative director Nick Worthington, copywriters/art directors Karl Fleet, Derrick Kim, copywriter/art director/typographer Lorenz Perry. The Sudan photograph was taken by photographer Philip Jones Griffiths in a refugee camp in 1988. The Dinka boy from Southern Sudan had gone insane after seeing his family massacred by government troops from the North.